In an industry largely overrun by cutesy J-pop idols, that a 46-year old woman can make for a fresh face is perhaps irony at its finest. I do realize that comparing a seasoned composer like Yuki Kajiura to J-pop idols is very much an apples and oranges comparison, but given that my interactions with music guests at Anime Expo have largely consisted of the latter, this difference is a wonderful change of pace. What Kajiura presented to the Anime Expo crowd who gathered to see her and FictionJunction perform is someone who is intelligent, thoughtful, and has a wry (perhaps unintentionally) sense of humor. But I am getting ahead of myself just a bit. From the onset, this year’s Yuki Kajiura/FictionJunction concert looked to surpass last year’s Kalafina concert. The vocal component should hopefully be similar since FictionJunction and Kalafina share two members in common, but the presence of live instruments on stage would theoretically be a welcome change from Club Nokia’s sterile emptiness, and the hope was that the instrumentation would bolster the performance by giving us a better musical experience overall. Sure enough, the vocals got off to a good start in Wakana’s solitary entrance to Fate/Zero’s (the overriding theme of this year’s Anime Expo) “The Beginning of the End,” with a haunting and melancholy entry along with a violin part that spoke volumes about the grimness of the Holy Grail War. 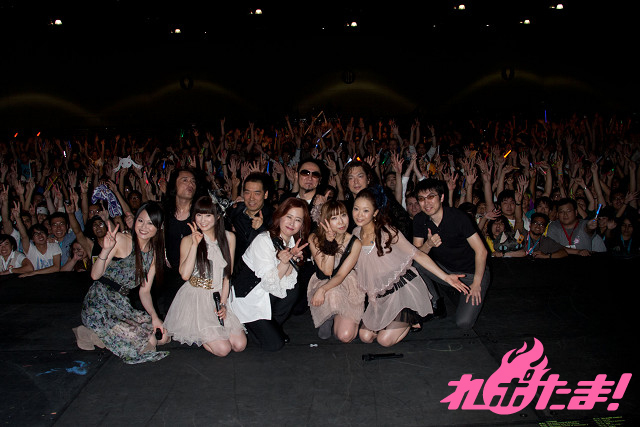 The group then proceeded to perform “Battle to the Strong” (also from Fate/Zero’s soundtrack) which featured a forceful delivery before moving on to Kajiura’s video game compositions in the image theme to Xenosaga II. Kajiura began speaking after the Xenosaga track and I was struck by her strong command of English as she introduced the members of FictionJunction one by one. Much laughs and “awwws” were had at Wakana’s expense when Kajiura said, “This is Wakana! Her voice is tragic… and sad.” During the introductions, she went over the roles and ranges each member played, labeling Wakana’s as the soprano, noting that Yuriko Kaida offers a wider range, mentioning Keiko and her role as the alto (and of the members, Keiko was the most solid performer of the evening), and talking about Kaori, whose voice is best suited for emotional ballads or harmonic blending. After talking a bit about the previously-played pieces, Kajiura and FictionJunction launched into “Vanity,” a mournful, melancholy track from her Fiction album and then moved into pieces from the .hack franchise. “In the Land of Twilight Under the Moon” was one of the highlights. Kajiura’s piano performance in the introduction, which had some exaggerated movements, brought forth a sorrowful aura and Kaori lay the vocal foundation that then transitioned into a forceful, immersive performance. Kaori’s work was superb, and I daresay the work as a whole compared favorably to Emily Bindiger’s rendition on the original. Kaori’s efforts on the next track, “Hanamori no Oka,” were a bit of a miss as she tried to navigate the vocal passages fluidly and ended up mishitting a few notes. On the whole however, her voice dripped with emotion and in doing so, showcased the balladic flair that Kajiura mentioned in the MC session. That performance made it quickly apparent why Kaori’s vocal qualities make her such a good fit for those kinds of songs. She also performed well as a unit though there were times I wished the harmonies were more apparent, but that’s more a function of the room’s acoustics and the live instruments being overbearing than a fault of the performers themselves. More on that later. Although the early Fate/Zero tracks were the most recent Kajiura work to be showcased, it wasn’t the only one. Given the popularity of Puella Magi Madoka Magica, pieces like “Sis puella magica” and “Credens justitiam” got a chance to shine with the former offering a melody that hints at the tragedies to come in the story. A solid showing, the only way “Sis puella magica” could have been better is if they had a live flutist to carry the main melody rather than a sound engineer inserting the instrument into the performance. “Credens justitiam,” as you might expect from looking at the setlist above, set itself apart by being one of the more upbeat pieces of the evening as the harmonies from FictionJunction lifted the audience up on currents of hope. But the most cohesive rendition of the evening went to the triad of songs from My-HiME, with “Himeboshi” transitioning to “Duran Shoukan” and then to the sheer excellence of “Mezame.” The way the songs were assembled together made it such that they could easily have been movements that made up a larger work. Of the three, the rendition of “Himeboshi” was the least impressive with Wakana being slightly off in the beginning though her harmonizing along with Keiko later on still yielded a beautiful piece. “Duran Shoukan” was just as intense as the original and the dissonance worked well to bring out the tension that left the audience on the edge of the seat. “Mezame” concluded the My-HiME set rather nicely, with lovely lilts from the four singers and excellent solos from both the violin and electric guitar. The energy that rained down in “Mezame” was absolutely fantastic with all the movement on stage. Of the four Keiko was easily the most energetic when it came to engaging the audience. Given the energy that we witnessed, I was hoping for a bit of a break after that set, but it looked like Kajiura had other ideas and powered through with the aggressive “Stone Cold” from Sacred Seven. The next track, Aquarian Age’s “Zodiacal Sign,” would open up with Kajiura-go (that language that Kajiura made up) and even feature bit parts of Kajiura herself singing along with the other FictionJunction members. Finally, after a few parting words, Kajiura urged the audience to open their hearts and proceeded with a performance of “Open Your Heart” which warmed me with a mellowness that turned hopeful, lovingly so, in a way that left me feeling rather light and happy. There was an encore in the form of “The World” which ended the concert well and affirmed Keiko’s vocal prowess as she absolutely delivered with those longing, melancholy tones to encapsulate an amazing evening all around. Still, it’s rare for me to say that any one performance can raise my opinions of any artist by several notches (the opposite is true more often than not!) but Kajiura proves to be a rare exception. What I would give to hear her talk more about her music given the thoughtfulness of her statements during the course of the concert for her refinement is a breath of fresh air and there is certainly more than meets the eyes and ears when it comes to her music. Thanks for the review … wish I could have been there! Certainly made for a very enjoyable evening and I’m certainly glad to have been able to experience their harmonic delights! Ahh, so that’s what the said about Kaori. I couldn’t remember. I guess What she said about Wakana marked everyone more than anything else haha. Also, How do you remember this much about the concert itself ? lol. Mezame was definitely my highlight during this whole concert, closely followed by Vanity and The Beginning of the End. For that, I just took a lot of notes as the concert went on. Intentional or not, I’m glad they left some lights on so I could see what I wrote. But yeah, instrumentals made things a lot better. That said, I’m kinda Kajiura Concerted out (Kalafina last year and now FJ this year?) so someone new would be welcome. Time to get that Kickstarter project in gear to bring Iwasaki or even Hisaishi over to North America. @kurotsuki what did kaori said about wakana? i just wanna know.. i got intrigued. I’m just a little disappointed they didn’t perform the more recent releases, and instead stuck to the kind of stuff they’ve been performing since 2008. Well, the Madoka and Fate/Zero stuff are pretty new, but it’s not surprising really to see them perform a lot of older stuff since that’s where the audience can derive a large part of the nostalgia value. I personally thought the mix was decent and don’t have any major complaints as far as song selection goes.